Public infrastructure in the 21st century is confronted with new challenges - adapting to climate change, meeting the economic, energy, water, transportation and social infrastructure needs of megacities in Asia, megaregions in North America and European city regions. Public infrastructure provides basic human needs - homes, water, energy for light, heat and cooking; the transport of people, raw materials and goods by road, rail, sea and air; hospitals, schools, sports and cultural facilities; communications networks; facilities for the criminal justice system; and civic and governmental buildings for democratic governance, social and political activity. Public infrastructure supports economic growth, increases productivity, generates employment, creates opportunities for the production and supply chains in construction and services, and improves community well-being. 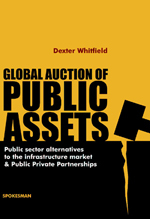 Wider adoption of Public Private Partnerships (PPPs) and growth of the global infrastructure market, financed by investment funds and pension funds, could fuel a new era of public asset sales. Already, the refinancing and the sale of equity in PPP projects has led to the buying and selling of public hospitals, schools, prisons and roads, furthering exploitation and profiteering. PPPs are promoted by the World Bank, IMF, development banks and via bilateral agreements in developing countries and the industrialised north. This is the first critical analysis which explores PPP programmes in the UK, France, Ireland, Germany, the US, Canada, Russia, Australia, China, India, Brazil and South Africa. Yet over US$500bn of PPP projects have failed, have little democratic control or transparency, are costly, lack innovation and are approved on narrow value for money or fraudulent public sector comparators. PPPs are ultimately publicly financed, either directly by government or indirectly through user charges, fares and tolls.